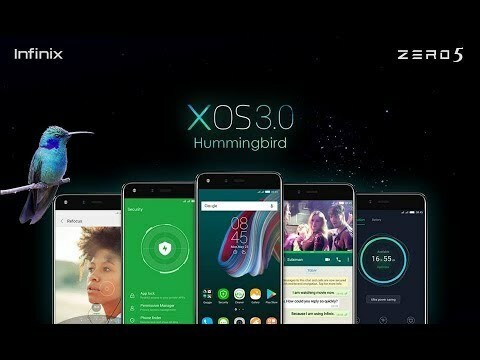 Okay so with the launch of the Infinix latest Zero 5 smart phone a couple of weeks back, Infinix thought it nice to seize that opportunity to introduce its Xfans to its new and latest version of Infinix XOS UI, the XOS 3.0 Hummingbird, making the said Infinix Zero 5 to be only Infinix smart phone at this time that is rocking this new UI yet. But as it is with all things Infinix, it is tradition for them to push some of its new features to some older eligible Infinix smart phones so that the love can be spread right.. So right here today, we're gonna be listing out some of the very important Infinix smart phones which we think has a higher probability of getting this latest Infinix XOS 3.0 Hummingbird update, including some of the few Infinix smart phones which will as well be getting updated to the latest Android 8.1 Oreo version sooner or later.. So without further ado, here is the list you all have been waiting for. Alright guys, so these are just the few phones that we can vouch for right now, we're sorry if your device is not listed, but we'll make sure to keep updating this article on regular occasions as more drama unfolds, so please subscribe to our newsletter to get the latest updates sent directly to your email for free. • Here's How To Update Your Infinix Note 4 X572 Smart Phones To The Latest Android 8.1 Oreo + XOS 3.2 Hummingbird Version. I can't really tell for the Note 2,cause it didn't get Android 7.0 Nougat update when it was rolled out for Infinix devices, so i don't really think they will be getting the Oreo update as well. But am pretty sure of the ones listed above. Hello what is the name and model of your device? Nwanne, did you say your instinct??? Lol.yea my instincts. cause we've not heard anything from Infinix yet. There is a very slim chance of that phone getting the update... but lets just keep our fingers crossed, while we wait. How about infinix hot 4 pro is it gonna have the update ? When are we getting this update? i dont think Zero4 and Zero Plus will getting Oreo Update since their stock os out of the box is Marshmallow.. but for zero 5 sure will get that update..
DiD you know that XOX 3.2 coupled with Android Oreo is already being pushed to Note 4 devices? will i get that update for my hot 4 or not im currently on xos 2.2 on nougat update. infinix note 4 struck while updating to oreo displaying "xos hummingbird"on the screen .what to do? I am updating my XOS Chameleon to XOS Humming bird but it got stuck from yesterday Saturday 10th 4pm and uptill now sunday 11 7am its not done yet. The only thing on the screen I can see now is XOS Hummingbird. Is it a problem or I should still be waiting? It shouldn't take that long to update, that happened probably maybe because your phone was rooted before you tried updating it. All you have to do right now is update it back to the formal Android 7.0 version that it was before, using SP Flash Tool, then try updating it once more to the 8.0 Oreo version. It will work just fine and smoothly. Hello Navin, what is the actual problem with your device. If it is that your device got stuck while updating, i will advice everyone of you having same issues to upgrade back to the older default version that came with your device, then just patiently wait for the stable oreo version. Thanks all. Hi, I am not able to locate Freezer in my Infinix note 4 XOS Hummingbird. Please help. Hello Godwin bro i am using Infinix Hot 5 running Xos 2.3 will i get Oreo update in future or not ! Yea... surely the infinix hot 5 lineups will get Oreo Update. But not anytime from now. Because they will first of all finish updating the top end devices first, like the Hot S2, the Zero 5 and the Note 4 lineups, before updating the Hot 5 devices. So you will surely get the Oreo update, but you just have to wait a little bit longer..
Was i able to answer your question? Bonsoir j'ai infinix note 4 et jusque actu j'ai pas encore la mise a jour 8.0 de ma ROM . comment faire ? Bonjour Bro, tous les appareils Infinix Note 4 ont déjà reçu la mise à jour android oreo .. Donc, ce que vous devriez faire maintenant est d'aller aux paramètres de votre téléphone, allez à "sur le téléphone", descendez jusqu'à ce que vous voyez la mise à jour du système. sur ce pour actualiser la base de données et vous donner votre fichier de mise à jour oreo .. ou vous pouvez aussi bien suivre ce lien pour voir un bon guide étape par étape sur la façon de mettre à jour votre infinix Note 4..
Hello Okumu, there is now a stable version of Android Oreo and XOS Hummingbird available for all Infinix Note 4 devices and it is sent through OTA (Over The Air), so try updating your system update menu from your phone's settings page. and you be good to go. Hello Meshack and Akintayo, sorry for the issues you are having, but there's now a stable Oreo + Hummingbird new software update being rolled out to all Infinix Note 4 smart phones. So try reupdating your phones again and hopefully that will solve the problem. Yes definitely, the Note 4 Pro will get Android Oreo + XOS Hummingbird update. The standard Note 4 already got it, so there's no doubt, the Pro will be getting theirs sooner or later. Forma infinx note 3 pro? Si sono the update? For infinix note 3 pro? is soon the update?